One big lesson I learned from my parents when growing up is to always sit down as a family for dinner at night! Some of my greatest memories are all TEN of my family members sitting down around our big table, enjoying my mom's delicious meals, and talking about our day or what was going on in our lives! I want that for my family too! But all too often in this day and age of chaos, multiple sports a season, and overtime work, mealtime sometimes becomes a rush of what is fastest to make and least nutritious for the family. So what is fast, nutritious and something the whole family will enjoy? With their honest ingredients and irresistible taste, McCain potatoes are an easy choice. And I am excited to share that McCain Potatoes is running a Facebook Contest where they will select 1 winner each week (8 winners total) to receive a $500 grocery store gift card! 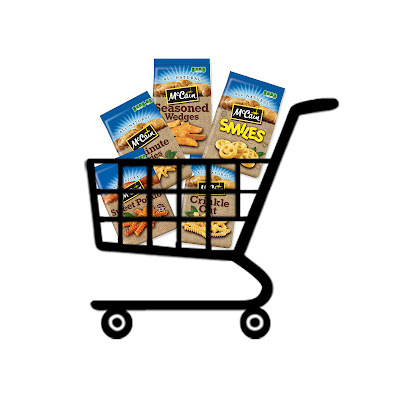 Contestants can also check out the Grocery Goodness Giveaway tab for to receive a $1 off coupon off any 1 bag of McCain Potato products! "Load up on groceries your family loves, and bring naturally good moments to the dinner table every time you serve McCain Potatoes."